The military development of France under Louis XIV became a model for Europe, encouraging like organization, administration, and tactics. The Sun King boasted the largest army of his day, and the most indomitable battalions on the Continent, at least until they were humbled in the War of the Spanish Succession. Considering the long run of history, perhaps the most important aspect of the wars of the Sun King was their increased scale, and nothing demonstrates this more than the dramatic growth in the size of armies. The French royal army expanded rapidly during the 17th century. From the late Middle Ages through the early 1600s, wartime strength usually peaked at no more than 60,000–70,000 men, and such numbers were maintained only for weeks before returning to lower levels. Between conflicts, the monarchy rarely maintained in excess of 10,000 men. Traditionally, we have estimated that the peak number of troops mobilized during the Richelieu at 125,000, but recent careful research suggests that this must be lowered to 70–80,000 in the field, plus garrison forces. Garrisons would raise the numbers, but not to 125,000. In any case, it is difficult to know the size of the army during the Thirty Years’ War with any certainty. Following the Treaties of Westphalia, the army shrank, even though France remained at war with Spain. The Sun King raised army size to unprecedented heights, as shown by official, or paper, figures: 134,000 during the War of Devolution, 279,000 during the Dutch War, 440,000 during the Nine Years’ War, and 377,000 for the War of the Spanish Succession. By carefully comparing paper figures with select muster figures of real units on campaign, it is possible to discount these numbers to estimate how many men were literally present under arms. Such a method suggests that the real wartime strength of Louis’s army hit a maximum of a bit over 350,000 during the Nine Years’ War. At the same time, Louis constantly increased the proportions of his peacetime, or standing, army. After the Dutch War, the number of troops kept in service between wars reached about 150,000, a 15-fold multiplication of the peacetime levels existing at the start of the 17th century. 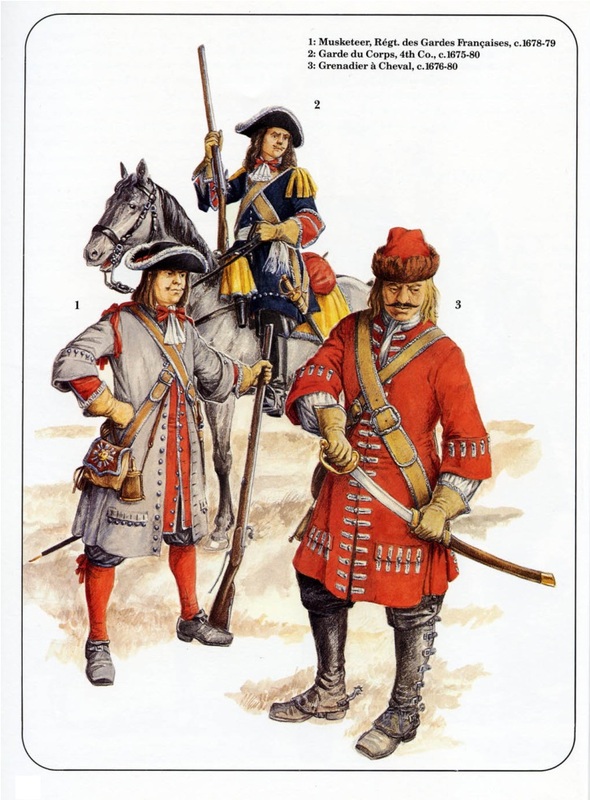 Louis’s army represented a new pattern of military force. 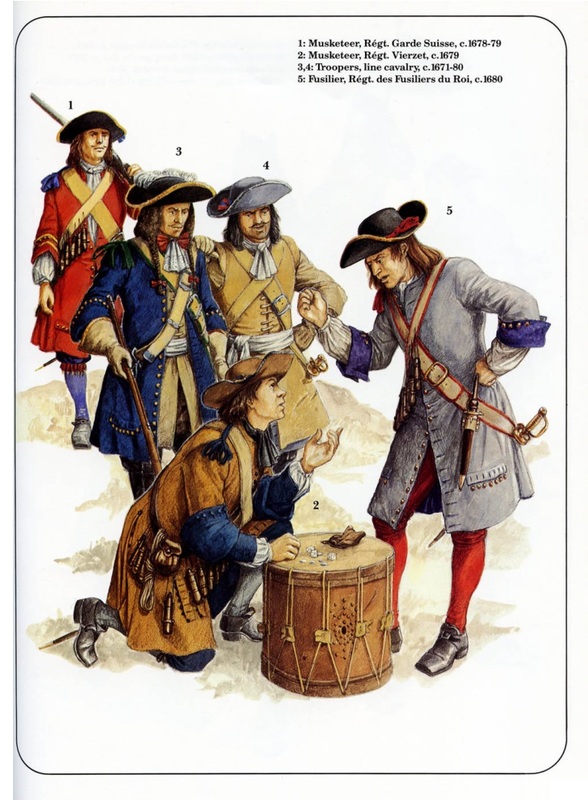 The troops of Louis XIV were no longer composed largely of mercenary bands and private forces supplied by powerful nobles, as had been the armies of his forebears. Cumulative reforms dating back to Richelieu and Louis XIII, but accelerated by Michel LeTellier, war minister under Mazarin and then Louis XIV, and the Marquis de Louvois, LeTellier’s son and successor, set the pattern. Instead of relying on hired bands, this new style of army was composed of royal regiments, laboriously raised, supplied, and trained. They were directly responsible to, and obedient to, the king. The structure and size of units from companies to brigades, along with the hierarchies of the officers within them, became very much what they are today. The battalion of 500–800 troops constituted the fundamental French combat infantry unit; one or more battalions formed a regiment. Cavalry formed in squadrons of about 140 during the War of the Spanish Succession, and two or three squadrons made up a regiment. This force relied primarily upon voluntary enlistment to fill the ranks, although one form of limited conscription or another could top up manpower requirements. Recruits were supposed to present themselves for service willingly. Recruiting parties tried to lure them with marshal display and tempt them with recruitment bounties, which varied according to supply and demand. 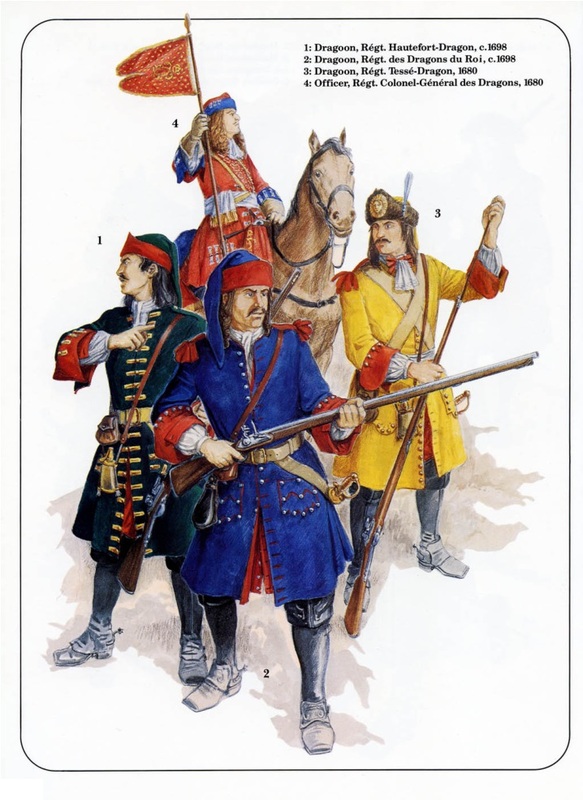 French regiments made up the bulk of Louis’s army, but he also mustered foreign regiments, which were structured with the same regularity and subjected to the same obedience as native units. The state asserted its control over its armed forces as never before. Previous to the personal reign of Louis XIV, generals often operated as if they were independent princes. However, the Sun King imposed greater order on his generals, particularly after Turenne’s death; seniority became the principle for precedence among high-level commanders, and obedience was expected and enforced at all levels. Changes in administration and command accompanied this transformation of army size, composition, and control. To manage these larger, more regular, and more expensive armies, governments created or vastly expanded the military ministries. LeTellier and Louvois multiplied their staffs and their workload. Through elaborate and costly logistical arrangements, the government fed its troops instead of letting them fend for themselves and royal inspectors strived to ensure proper clothing and equipment for the troops. It is highly illustrative that uniforms became standard at this time. Convoys snaked from grain magazines, to field ovens, to camps, providing the necessary bread. Government-purchased herds supplied meat. As much as possible, French military administration strove to take care of the troops because authorities feared that ill-clothed and starving soldiers would desert, or at least turn to marauding and thus dissolve discipline and unit integrity. Despite all the efforts of the state, the expenses of these huge armies often exceeded available funds; therefore, all antagonists tried to commandeer local resources. Troops drew on local forage for horses by dispatching war parties to harvest it in nearby fields. And, of the utmost importance, armies imposed war taxes, or ‘contributions,’ to be paid in kind or in money by unfortunate villages and towns in the war zone. The need to collect contributions sometimes became a determinant of strategy. 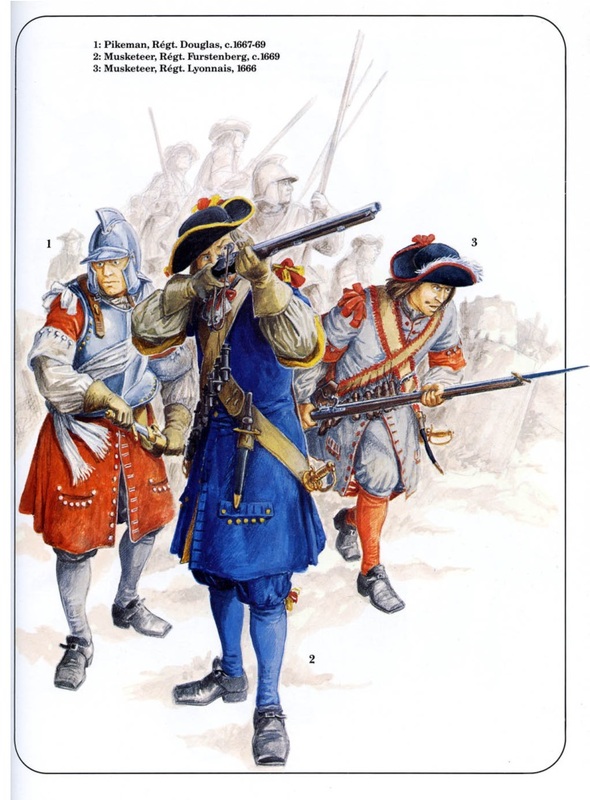 As to weapons and tactics, French infantry still carried matchlock-muskets and pikes early in Louis’s personal reign, to be exchanged for flintlock fusils and bayonets after 1700. Other armies, including the English and Dutch, made this transition a bit earlier. Both musket and fusil were reasonably effective at 50–100 yds (45–90 m) against large formations, but neither smoothbore was a sharpshooter’s weapon. Limitations in range and accuracy doomed infantry to blasting away at close quarters, with deadly results. Infantry tactics evolved slowly, but they were always based on a linear deployment of battalions. The old mass squares of the early 17th century had disappeared from the battlefield before Louis’s personal reign. Cavalry shed more armor and relied primarily on the sword. Cannon hurled various packets of death across the field, with the big 24pdr siege cannon highly effective at 600 yds (550 m) and capable of inflicting casualties at 2,000 yds (1,830 m). Artillery began battles at long range, and combat often climaxed with pounding hooves and slashing swords, but infantry was the queen of battles. Battle by nature was a theater of chance and risks, requiring high casualties to achieve doubtful outcomes; this reality made siege warfare all the more preferable. The science and art of fortress design reached its peak with the work of Sébastien le Prestre de Vauban, the great engineer who served Louis. He certainly did not originate this low-lying style of fortifications, but he carried it to a higher level of perfection. Engineers carefully plotted the angles of the arrowhead-shaped bastions so that cannon and musket fire from one could sweep the ditches in front of the others to each side. In this way the bastions functioned less as walls than as mutually supporting strong points with intersecting fields of fire. In 1673 Vauban transcended the design of individual fortresses to propose the Pré Carré, or dueling ground, which would provide a defense in depth composed of two lines of fortress across the northeast frontier of France. Sieges against such fortresses were rational and predictable. Before the formal siege began, a fortress was surrounded, ‘invested,’ by cavalry. Next, commandeered peasants, or ‘pioneers,’ dug siege lines. Lines of circumvallation faced outward at a distance of a mile (1.6 km) or more all around the fortress to protect the besieging army from enemy relief forces. Lines of contravallation faced inward to contain the garrison and provide protection against sorties. Once well established, the besiegers opened approach trenches and drove them toward the fortress. Vauban’s system of attack employed three ‘parallels’ – trenches dug parallel to the side of the fort chosen for the main attack. The first parallel was situated 600 yds (550 m) from the fortress and mounted batteries to batter its walls. Increasingly from the Dutch War through the War of the Spanish Succession, contending armies constructed long defensive field fortifications at times stretching over 100 miles (160 km). Such lines were originally intended only to stop enemy raiding parties and thus shelter friendly territory and protect resource bases; however, they became more substantial with time and, if occupied by a large number of troops, could stymie entire armies. These lines employed rivers, inundations, and other defensible terrain, if possible, and on open ground employed trench lines constructed with all the science and art of fortification. This entry was posted in Armies, France by MSW. Bookmark the permalink.